Touring Atlanta can be as simple as stopping on the sidewalk or in a park or residential neighborhood and reading one of the hundreds of Georgia Historial Markers peppered throughout the city of Atlanta. Managed by the Georgia Historical Society, headquartered in Savannah (with an office in Atlanta), the Historical Marker program is adding markers all the time, including a new one this coming Monday morning as part of the marking of the 150th anniversary of the Amercian Civil War. "In 1839 "Cousin John" Thrasher built a settlement called Thrasherville at this then forested site near the peg marking the planned terminus of the Western & Atlantic RR. This railroad was later built by the State of Georgia to provide a link to the north for other Georgia railroads. While building the northward near Griffin, the Monroe RR accepted John Thrasher's bid to build an embankment to enable a future junction of the Monroe RR with the W&A RR. The Monroe Embankment, a $25,000 project, required about two years to complete. To fulfill his contract John Thrasher brought in many laborers, built rough shelters to house them and opened Atlanta's first store. Atlanta's first religious service, labor trouble, social event and baby are associated with this settlement. In 1842 the terminus was changed to the place now marked by the Zero Mile Post. Thrasherville, Terminus and Marthasville were names given to the railroad generated settlement activity which preceded Atlanta. 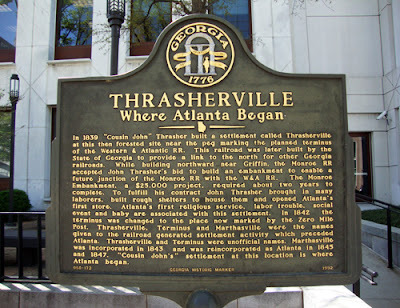 Thrasherville and Terminus were unofficial names. Marthasville was incorporated in 1843 and was reincorporated as Atlanta in 1845 and 1847. "Cousin John's" settlement at this location is where Atlanta began." So, as you can see, you can learn quite a bit about our fine city just by taking a few minutes to read our historical markers...and then go impress your friends with just how much you know about Atlanta! John J. Thrasher (Cousin John), the same, was also the founder and first mayor of Norcross, Georgia. He founded and laid out the city for a connection on the railroads. Cool to learn, Steven! Thanks for sharing.